The Ford C-Max Hybrid was introduced to provide the first true alternative to the top selling Toyota Prius and although the EPA fuel economy estimates put the C-Max Hybrid below the Prius – this curvy 5-door is truly the best competition for the popular Prius in the hybrid segment thus far. There was a very long period of time where the Toyota Prius had no competition in the hybrid segment and while there were fuel efficient hybrids on the market, none of them offered the level of efficiency and space – until the new Ford C-Max Hybrid arrived. Even with the slightly lesser fuel economy expectations from the C-Max, the Ford compact hybrid offers comparable passenger space and cargo room with better performance in a very attractive package with pricing that is very comparable to (if not better than) similarly equipped Toyota Prius models. 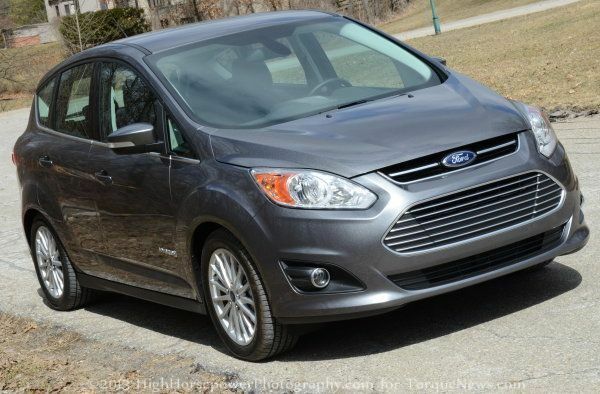 One of the most attractive features of the 2013 Ford C-Max SEL Hybrid is that it doesn’t look like a hybrid. The exterior styling features the similar design language as the majority of the current Ford car lineup and this car looks so much like the Fiesta, Focus or Fusion that the C-Max exterior styling could have just as easily have been applied to a non-hybrid model whereas many modern hybrids have a design that puts aerodynamics over everything else to make sure that the slippery form offers the best fuel economy possible. The C-Max offers great aerodynamic properties but it does so without looking like something out of a 90s futuristic portrayal of “today’s” cars. The front end of the 2013 C-Max wears a similar large lower grille opening to what makes the rest of the Ford car lineup so attractive with lots of chrome in the grille, headlights and fog light housings giving the car a very upscale look. The short hood leads to a sloping windshield and a long roofline that tapers down to the rear hatch in a form that offers great aero properties but it looks like traditional car. 17 inch silver painted wheels and some scant chrome trim along the side bolster the higher end look of the C-Max while big, bright taillights make for great visibility during nighttime driving. Also, the roomy greenhouse with lots of glass and thin pillars make for great driver visibility all around the vehicle. Finally, the Ford C-Max has a wide, low and sporty stance that allows it to cut through the air but it also makes this roomy hybrid compact pleasing to the eye – unlike models like the Nissan Leaf that were clearly designed by engineers who put aerodynamics first and aesthetics last. The 2013 Ford C-Max Hybrid interior has a very upscale look and feel as soon as you climb in – especially for a vehicle that starts right around $30,000 in the loaded up form of my test car. The dark leather on the front and rear seats feature contrasting white stitching and that leather design is continued on the steering wheel and through the center console. The front seats are deep, heated and comfortable with plenty of head room, leg room, knee room and hip room for the driver and front passenger while the elbow space can get a bit tight across the small center armrest. The rear seats offer good elbow, hip and shoulder space for the outboard passengers and while those parameters are predictably tight for the awkward center seating position, there is plenty of headroom for everyone in the back. The biggest downside for the rear seats is that the leg room is a bit tight for adults (or very tall children) but that leg space is no tighter than it is in comparably sized vehicles. In fact, I felt that although leg space was tight in the back, it was better than other compact sedans or hatchbacks that I’ve experienced. Finally, the C-Max has a huge rear cargo area and if you need even more space, the back seats quickly and easily flip forward to create a huge cargo area when you don’t have rear passengers. The hybrid segment is all about cutting edge technology so it should come as no surprise that the 2013 Ford C-Max SEL Hybrid is packed full of all sorts of high tech gadgets. Like so many other newer Ford products, the C-Max has a gorgeous customizable gauge cluster that has two big, bright screens flanking a fixed analog speedometer. The two customizable outer portions of the driver information center allows the driver to pick things like vehicle parameters (fuel range, MPG, energy usage, drive mode, etc) while the right side includes things like the navigation readout, a display of what is playing on the radio or the neat little efficiency gauge that has leaves that grow as you drive more efficiently – and vanish as you drive less efficiently. The image below shows the gauge cluster with the energy usage screen on the left (including battery power, average MPG, current MPG and fuel levels) while the right side shows the “Efficiency Leaves”. The right side also includes some standard bits of information like the outside temperature, a compass and a clock so there really isn’t much that the driver cannot learn from the customizable gauge cluster. This area is controlled by the directional buttons posted on the upper spokes of the steering wheel with controls for the sound system and cruise control system mounted just below on unique “rocker” switches. Between these steering wheel mounted controls and the voice controls – there isn’t much that the driver cannot adjust without taking his or her hands off of the leather wrapper steering wheel. The key piece of technology inside of the 2013 Ford C-Max SEL Hybrid is the MyFord Touch with Sync and while this infotainment system has been criticized by some – it is nowhere near as complicated as many critics make them out to be. As Ive told several car-shopping readers who were afraid of dealing with the learning curve of MyFord Touch, it only takes a short time sitting in your driveway and familiarizing yourself with the layout of the system to get a good working knowledge of how everything works. Even those buyers who are completely new to modern infotainment technology will find that the most important and most commonly used features of MyFord Touch – the sound system, climate control and navigation – are actually very easy to use once you have spent even just ten minutes playing around with the controls. Don’t believe all of the negative publicity about MyFord Touch if you are considering the C-Max or any other similarly equipped vehicles…go sit in a dealership and play with the controls with or without the help of the dealership employees and I bet that you will find that this system is much smoother than many claim. I think that MyFord Touch is one of the best infotainment interfaces on the market today and the few readers who have reached out to me with questions on the system have agreed as many of them have quickly purchased a Ford vehicle with this system. Also, the inclusion of the Sony sound system is a great inclusion that provides great sound quality whether you listen to country, hip hop or hard rock. Ford has put a tremendous amount of effort into making their interiors very high end looking and feeling and the 2013 Ford C-Max SEL Hybrid is a glowing example of those efforts. Between the massive amounts of infotainment technology, the high tech gauge cluster and the plush leather seats – the C-Max offers a luxury level interior with a price that is anything but luxury level. The 2013 Ford C-Max Hybrid is powered by a 2.0L Atkinson engine with an electric assist motor that provide a total output of 188 horsepower – 54 more horsepower than the Toyota Prius. This means that the C-Max provides substantially better performance than the Prius but that added power also allows the Ford hybrid hatchback to make better use of the EV mode. With so much power on tap, less driver input is needed to accelerate with the flow of traffic and that equates to better fuel economy in many situations. Ford and the EPA expect that the C-Max hybrid will offer 45 miles per gallon in the city, 40 on the highway and a combined figure of 43mpg and it would be improper of me if I didn’t bring up the controversy focusing on the EPA-approved fuel economy figures. While some owners and some media outlets are quick to cry foul on those estimated figures, I found that the C-Max is very capable of vastly exceeding those numbers. One day I took the Ford C-Max out to run my typical daily errands in and around Milford Michigan. The speed limit on the two lane roads around my office is usually 50 miles per hour with some areas dipping down around 25mph and local highway speed limits sitting at 70mph. I found that my worst fuel economy figures were gotten (predictably) on the highway when I was cruising along at 70-75 miles per hour. In those conditions, the C-Max was not able to hit that 40mpg number but in city driving situations – I was able to crush the EPA numbers. Over the course of a 42 mile drive around the greater Milford area, I was able to average over 60 miles per gallon and the key factor in doing that was Ford’s expanded EV mode. Unlike many EV modes in hybrid vehicles that only allows low-speed electric-only driving, Ford claims that the C-Max is able to travel at speeds of over 60 miles per hour in EV mode. I was unable to find an area where I could maintain a speed of greater than 60 miles per hour only in EV mode but on the roads around Milford where the speed limit (and traffic) kept me under 55 miles per hour, I was almost always in EV mode. With the aid of regenerative braking and the input of the gasoline engine while it was running, I was able to run the majority of my errands on those 42 miles in EV mode. The only times where the EV mode had to disengage was when I was going up steep hills or having to accelerate away from stop lights but on the long, winding roads of Milford which have very few stop lights or stop signs – I was able to easily average better than 60 miles per gallon during my daily driving needs. I believe that if I avoided highways where the speed limit of 70mph pushes me well away from the reach of the EV mode, I could easily see better numbers than those offered by the Prius thanks to Ford’s expanded EV mode. Best of all, when I wanted to drive the Ford C-Max Hybrid hard with no regard for fuel economy, the 188 horsepower hybrid drivetrain provides substantially more punch than any of the top selling hybrids sold in America. The acceleration from both a stop and when passing on the highway is strong and smooth – I would go so far as to call it spunky and that I something that I’ve not said about many affordable hybrids. Also, while the low rolling resistance tires do transfer some road noise through the steering column and the suspension, the ride is very comparable to other hybrids with similar tires but the C-Max offers really great handling in tight quarters and on the highway. Quality handling has become a main concern among fuel efficient compacts and while not all hybrid models conform to that shift, the C-Max Hybrid handles as well as most non-hybrid compacts that I have driven. The quick cornering in tight quarters allows you to throw this car around (if that is your thing) and on the highway at higher speeds – the C-Max felt strong and confident on the longer, sweeping turns. The 2013 Ford C-Max offers incredible fuel economy measures in the right conditions and numbers comparable to any car sold in the US in all conditions…even though it falls short of the Toyota Prius in terms of the EPA ratings. That being said, I was able to get better fuel economy with the C-Max during my daily driving than I was in any other vehicle shy of the Chevy Volt. Based on my experiences, those drivers who don’t spend much time driving over 55 miles per hour will almost certainly be able to comfortably exceed the EPA numbers and unlike most hybrids and many compacts – the C-Max combines this great fuel economy with equally great driving characteristics in terms of both acceleration and handling. The Ford C-Max offers cutting edge hybrid fuel economy with impressive EV mode range and it does so without bringing along many of the downsides to the modern hybrid market so owners can have their fuel economy cake and enjoy the drive as well. if you are shopping for an efficient hybrid 5-door that doesn’t force you to suffer through an uber bland driving experience with plenty of passenger space and a ton of cargo space – the Ford C-Max Hybrid should absolutely be on your short list. While the EPA numbers list the C-Max as offering lesser fuel economy measures than the Prius, the expanded EV Mode of the C-Max can allow the hybrid Ford to offer better fuel economy than the Prius in certain driving conditions (like the ones described above). The Ford C-Max can comfortably go toe to toe with the Toyota Prius in interior space and in the level of high tech feel but with better performance and a slightly lower price – the Ford makes up for the slight differential in fuel economy figures. Plus, with EPA numbers varying based on driving situations and conditions, the C-Max can best the Prius under the right circumstances while still offering a more engaging drive and a lower sticker price.